Do Potatoes Need Sun to Grow? How Much Will 5 Lbs. of Seed Potatoes Yield? How Many Pounds of Seed Potatoes Per Row? How Many Potatoes Grow From 1 Seed Potato? What Is the Best Climate for Planting Potatoes? How Much Space Is Needed When Planting Potatoes? Potatoes require well-drained, slightly sandy soil in order to thrive. This type of soil is often low in nitrogen, a nutrient the potatoes also require for healthy growth. Fertilizing the potatoes in your home garden both before planting and once they are established helps ensure your plant produces healthy, well-formed tubers for use in the kitchen. While a soil test tells you the exact fertilization your garden needs, using general fertilizer requirements will still give your potatoes a good chance at healthy growth. Loosen the soil to 12-inch depth using a power tiller. Remove any stones or large roots from the bed and dispose of them. Spread 10 pounds of 10-10-10 analysis fertilizer over every 100 square feet of garden bed in the spring about one week before planting the potatoes. Work the fertilizer into the top 10 inches of loosened soil. Fertilize potatoes a second time six weeks after planting. Work 1 tablespoon of 10-10-10 analysis fertilizer into the soil by each plant. Work the fertilizer in 6 inches away from the stem of each plant so you don't get fertilizer directly on the roots, which may cause damage. Cut large seed potatoes into pieces approximately the size of one large hen egg. Ensure that each piece has at least one sprouted eye. Smaller potatoes can be planted whole. Dig a trench in the prepared garden space 6 inches deep. If you plan to plant more than one row, space subsequent rows 2 feet apart. Break off all but one long, stringy potato sprout from the seed potato pieces. If the sprouts are still small, there is no need to break them off. Space the seed potatoes 10 to 12 inches apart in the trench. With a long stringy sprout, lay the sprout horizontally in the row, to be completely covered. Cover the seed potatoes with at least 4 inches of soil. Do not water until the sprouts emerge from the soil. Spread the seed potatoes over the work surface. Cover the surface with newspaper to protect the surface if the potatoes are going to be placed on a table or countertop. Turn the potatoes over once a day to expose them to daylight. Cut and cure the potatoes for planting when the "eyes" have begun to sprout. The cure is complete when the cut portion of the potatoes feels dry to the touch. Spread the potatoes in a single later in a tray. Store for two weeks in a dark location, at 45 to 60 degrees Fahrenheit and 85 to 95 percent humidity. Discard any potatoes that are shriveled, soft or have blemishes. For best results, potato plants need full sun, even though the potatoes themselves develop underground. You should look for a spot in your garden not surrounded by taller plants that could block out some of the natural light. Potato plants also have specific soil needs and do best with a well-draining loose soil that contains a lot of organic matter. Heavy soils or clay soils may cause drainage problems for the plants. Once you have a nice sunny spot to plant your potatoes, dig a hole 3 inches deep for each seed piece. You should space the plants 10 inches to 12 inches apart, and rows of plants should be about 3 feet apart. Wipe off any dirt from your harvested red potatoes. 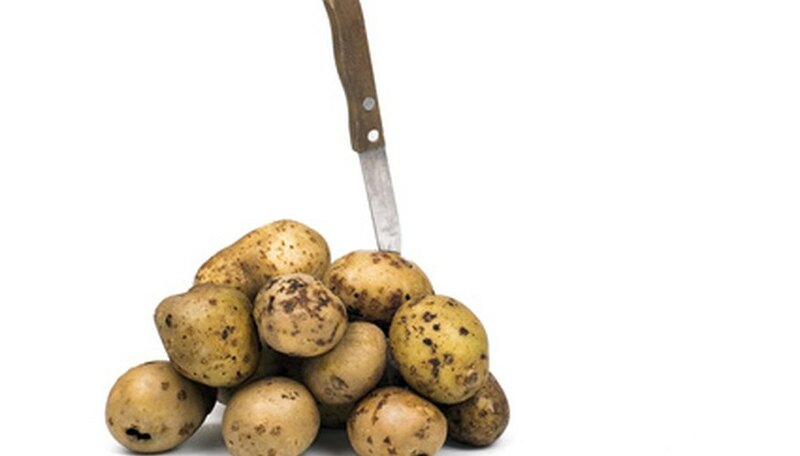 Carefully examine the potatoes for signs of greening, cuts, bruises or disease and discard these. Spread the remaining potatoes in a single layer on top of a newspaper-lined basket. Drape another piece of newspaper over the potatoes and store them in a dark spot with high humidity and a temperature between 60 degrees and 65 degrees Fahrenheit for 10 days to cure the red potatoes for storage. Move the box of potatoes to a completely dark spot with 85 percent humidity and temperatures between 40 and 45 degrees Fahrenheit for up to four months. Five pounds of seed potatoes plants approximately a 40- to 55-foot long row, yielding between 60 and 100 pounds of potatoes in a good harvest. Cut seed potatoes into 1 1/2 to 2 ounce pieces, each containing at least one eye. Plant pieces approximately 12 inches apart. Choose a place in the garden with well-drained soil and full sun. Perform a home soil test. 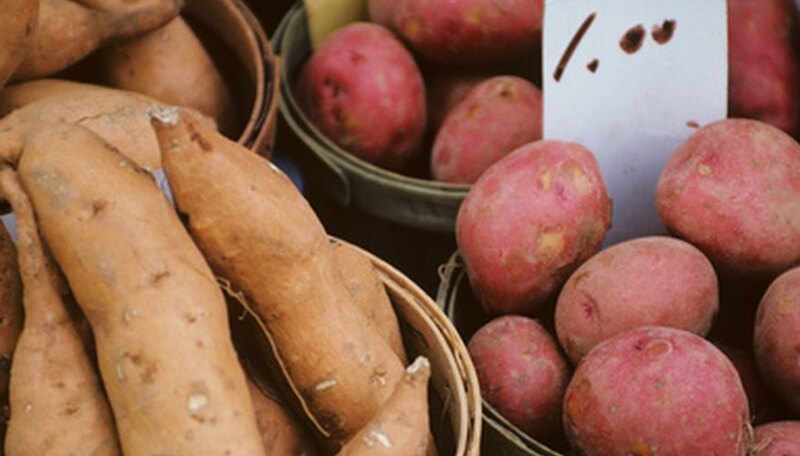 Red potatoes do best in soil with a pH of 6 to 6.5. If the soil is basic, add 5 to 6 inches of compost to the soil and work it in to a depth of 3 feet. Dig holes about 4 inches deep and 11 inches apart. Place the seed tubers into the holes and cover them with 4 inches of soil. Space the rows of potatoes about 2 feet apart. Plant the potatoes when the soil is 60 degrees Fahrenheit. Add 1 inch of water to the red potatoes once a week. Allow the water to soak into the roots. Sandy soil will need water two to three times weekly. Remove weeds from around the red potato plants. Pull them up by hand. Harvest the red potatoes when the leaves of the plants dry. Till the ground lightly with the spade fork to bring the potatoes to the surface. Pick them out of the dirt. Potatoes are one of the easiest vegetables to grow. When planting seed potatoes, plant the potatoes two to three inches deep with the eyes pointing up. This will allow the tubers to grow towards the surface and reach light. Approximately 9 to 12 pounds of seed potatoes plants a 100-foot row. Cut pieces into 1 1/2 to 2 ounce pieces and plant approximately 9 to 12 inches apart. A 100-foot planted row yields approximately 150 to 175 pounds of potatoes. Choose a granular fertilizer. Select any standard vegetable fertilizer with a low amount of nitrogen--the nutrient encourages foliage production, which is undesirable in potato plants--and a higher percentage of phosphorous. Example fertilizer ratios include 6-24-24 and 8-24-24. Prepare the trench or hill in which you will place the pieces of potatoes that you're using as seed. Apply the fertilizer according to its label's guidelines but an inch below the soil layer where you will lay the potatoes. This places the extra nutrients within direct access of the newly formed potato plant roots. Plant the seed potatoes in the trench. Cover with soil, and water twice daily. Apply fertilizer on the soil's surface every four weeks once the potato plants have sprouted and broken the surface. Administer the fertilizer before your regular watering to help dilute the nutrients and prevent plant burns. Red La Soda is a mid-season variety of potato that was developed in Louisiana in the late 1950s. Red La Soda is a thin-skinned potato with very white flesh. The tubers may be irregularly shaped and have deep eyes. Viking potatoes are heavy producers. They are also a mid-season variety, maturing early and have a dark-red color. Viking potatoes keep well in storage. This smooth-skinned red potato is an early-season variety. 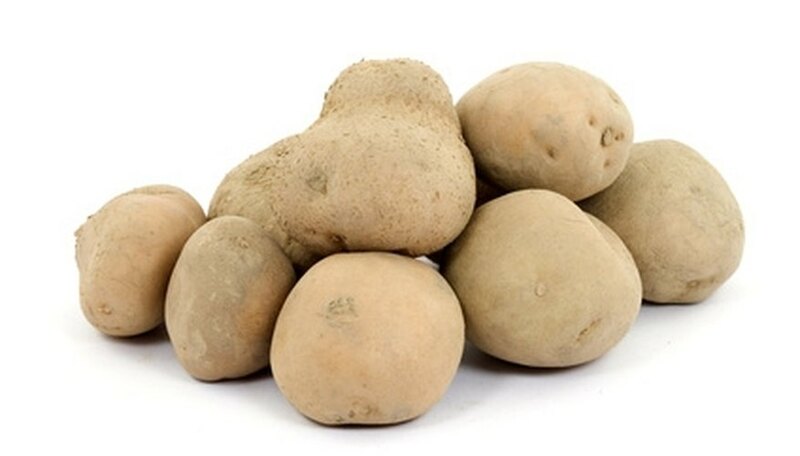 It has a low-moisture content, making it more suitable for baking than other red potatoes. Like Vikings, Norlands store well. Harvest your potato crop from healthy plants by digging them up with a pitchfork and lifting the potatoes to the surface. Sort through the potatoes to collect the ones that are egg-sized or smaller. Look over the smaller ones to make sure they are firm without cuts or any signs of damage or rot. Keep only the best looking potatoes to be your seed potatoes. Set the seed potatoes out in the sun for a few hours to dry. Use your hands to gently brush away any excess soil from the skin without pressing so hard you rip or damage the skin. Place the potatoes in a dry window for two to three days to encourage them to go dormant. After a few days have passed, set the potatoes into an empty cardboard egg carton and close the lid. Store the potatoes in a dry, dark place with good air circulation where they can sit until the following late winter or early spring. 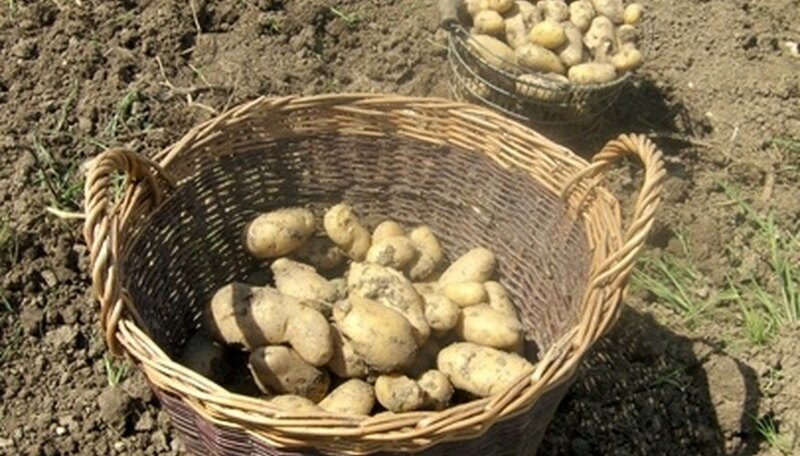 Check on the potatoes once a week and pull out and discard any that are rotting. Planting time for potatoes in Wisconsin depends on the type of potato you want to grow. Early varieties should be planted as soon as you can work the soil, usually late April, according to Wisconsin Master Gardeners. Mid- to late-season potatoes can be planted from mid May to mid June. The Wisconsin Master Gardeners also recommends you get a head start on the growing season by sprouting your potatoes two to three weeks before you plant. This is especially effective for early season potatoes. Potato seedlings are delicate. If you try to sprout them ahead of time, handle them with extreme care on planting day. 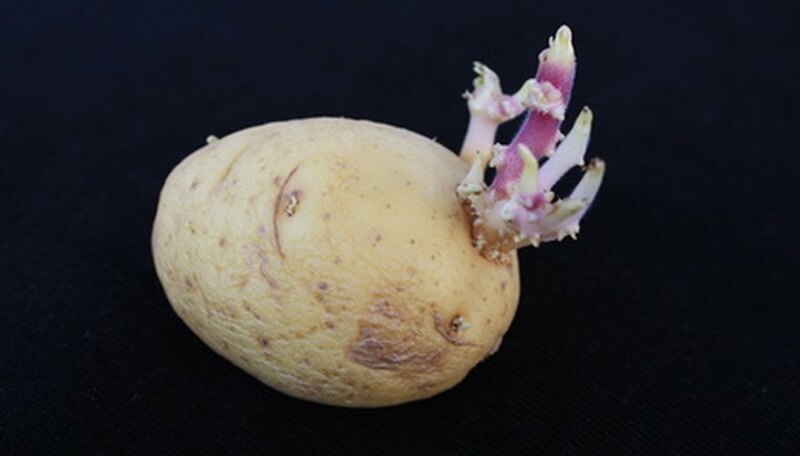 Count the "eyes" or sprouts on the potato. Ideally, the seed potato should have two or three eyes. 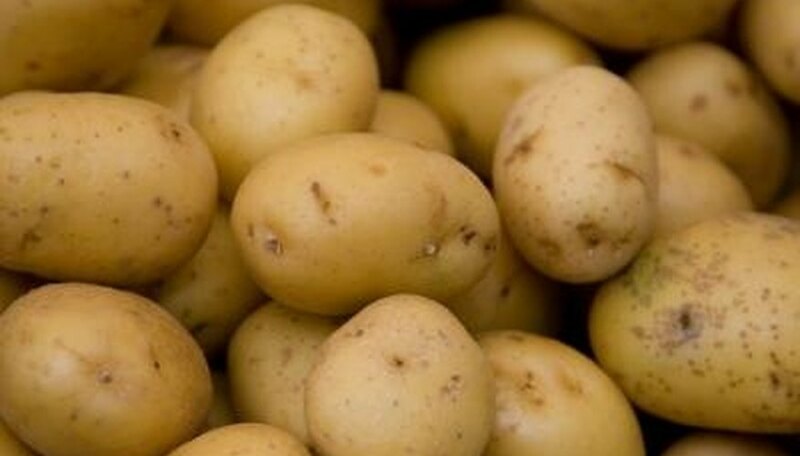 If some of the potatoes are larger and have more eyes, use your fingers to rub off all but two or three of them. Seed potatoes that have started to sprout are desirable. Prepare the soil. 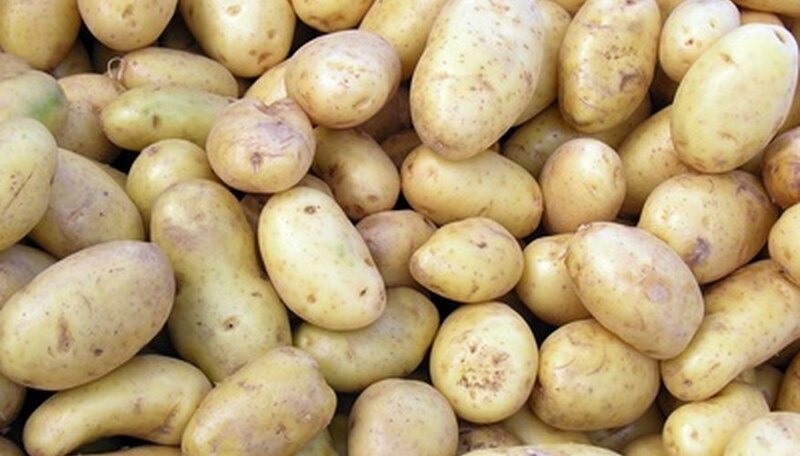 Potatoes prefer loose, well-drained soil high in organic material with high water retention capability relatively free of rocks and with a pH of 5.5 to 6. Work the soil to loosen it, using a tiller or cultivation tool. Dig holes 4 to 6 inches deep and about 15 inches apart, using a shovel. Plant a sprouted seed potato, sprouts pointing up in each hole, and cover with soil. Fill the holes completely, but be careful not to damage the sprouts. Water well to moisten the soil, but do not overwater. If the soil tends to form a crust, break the crust and loosen the soil surface with the shovel until the sprouts break the surface. Use a hand tiller to aerate the top eight to nine inches of soil in the garden bed. Remove any debris from the dirt that could make it difficult for the potatoes to expand and grow, such as rocks and roots. Dig holes that are about twice the size of the whole seed potatoes, spacing them 10 to 12 inches apart. Space the rows 24 to 36 inches apart to give the plants room to spread. 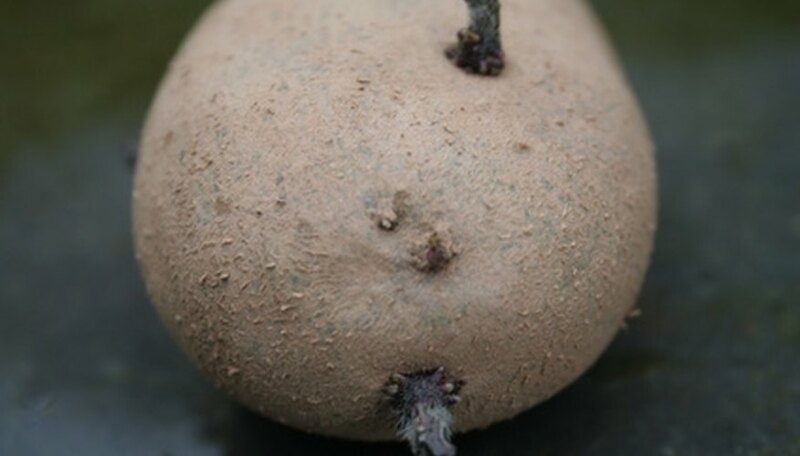 Drop a seed potato into each hole, smoothing the dirt over the top. Cover each row with a ridge of soil that's one to three inches high. Water the potato plants lightly so that the ground is just damp. Cut the seed potatoes into pieces containing at least one "eye" and the approximate size of a medium hen's egg. Spread the cut seed potatoes on newspaper, cut-side up, to cure, or "heal over," for 24 to 72 hours. Weigh the cured seed potatoes. Multiply the number of pounds of cut seed by 10 to reach an approximate average yield of finished potatoes. In an above average garden space, the yield may be as much as 20 times the weight of the seed. For example, 5 pounds of seed will yield 50 pounds of potatoes in an average garden space, while the same 5 pounds could yield 100 pounds if conditions are perfect. The average yield from one seed potato is typically 6 to 12 new potatoes. Variety, soil conditions, spacing and harvest time all affect the exact amount. Depending on the variety planted, one 100-foot row, with seed pieces planted 36 inches apart, can produce from 150 to 300 pounds of potatoes. Till your planting area in the early spring, as soon as the ground can be worked, to loosen and break apart the soil. Use a hoe to dig a trench as long as like. Make it 3 inches deep into the plowed area. Place pieces of seed potato in the trench, leaving 9 to 12 inches between the pieces. Cover the seed potatoes with the dirt removed when hoeing the trench. Cover the row with a 4- to 5-inch layer of straw or hay to act as mulch once the plants have broken the surface of the garden bed. This will allow the row to retain moisture. If you want a second row, make it 2 to 3 feet from the first row. Plant multiple rows in the same way as the first. Poke several holes in a plastic garbage bag with a knife. Line a box or metal garbage can with the prepared garbage bag. Mix just enough water with the peat moss so that the moss feels damp to the touch without dripping water. Fill the garbage bags with alternating layers of potatoes and peat moss, starting and ending with peat moss at the bottom and top of the garbage can. Cover the can with the lid and store the potatoes at 50 degrees F for up to three weeks for early potatoes or 40 degrees F for up to nine months for late potatoes, according to Cornell University. Purchase and store certified seed potatoes in a cool place for two weeks. 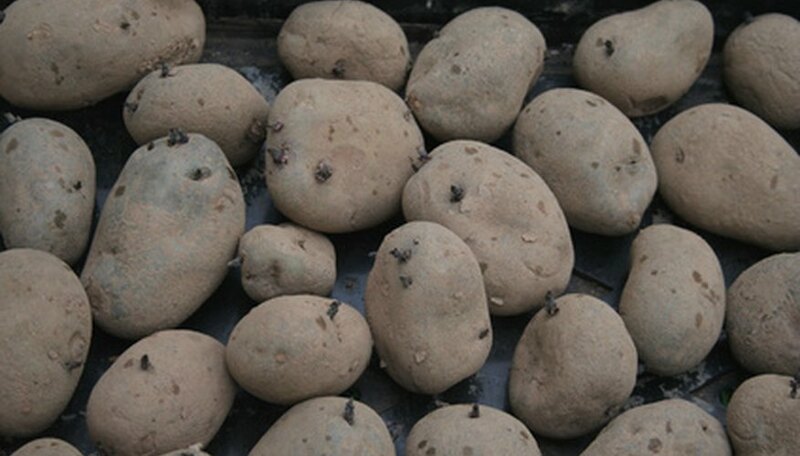 Spread seed potatoes two weeks after purchasing, in a single layer in a greenhouse, room or barn that receives light. This is the start of a process known as "green sprouting." Provide high humidity for seed potatoes by misting the area lightly once daily. Turn the seed potatoes every four to five days to encourage strong, uniform sprouts. Work 10-10-10 fertilizer into planting bed soil, using 3 pounds per 100 square feet, before planting seed potatoes. This prevents feeder root burning and decay. Plant seed potatoes in the spring when soil has warmed to 45 degrees, in a furrow or hill 4 to 6 inches deep, spaced 8 to 10 inches apart in rows, from 32 to 36 inches apart. Cover with about 2 inches of soil. Mound soil up around plants when they are 5 or 6 inches tall, a technique called "hilling." Continue the process until the plants are 12 to 15 inches high. Cover any weeds while hilling, but do not totally cover potato plants. According to the "American Journal of Potato Research", root hormone dusting powders and ground limestone can be used on cut seed potatoes but there is no verifiable benefit. Instead, simply cut the seed potatoes into egg-size pieces with at least one eye per cut and allow to "heal over" in a cool, dark place for one to two days to prevent root rot. Arrange the potatoes in a single layer on a pallet covered with several sheets of newspaper, or a box with a screened bottom, or open-weaved-bottom vegetable bin, for proper ventilation. Ideally, the potatoes should not be touching. 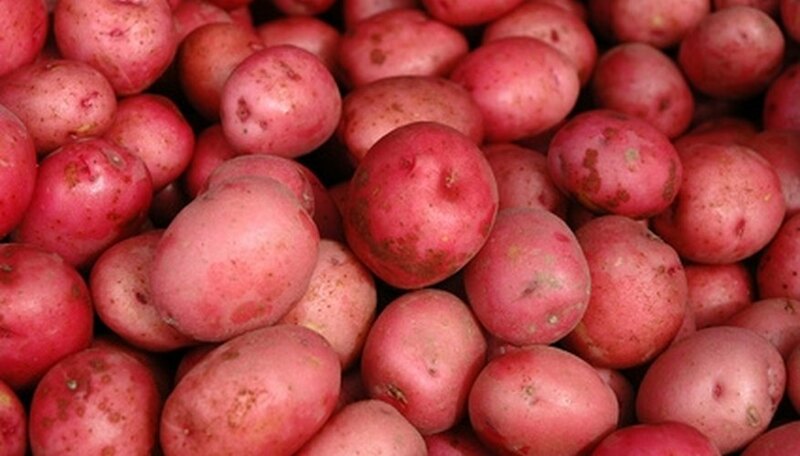 Store the Red Pontiac potatoes in a cool, dry, dark location at temperatures between 45 and 50 degrees F.
Check the potatoes several times a month and discard any potato that shows signs of spoilage or sprouting. Store the Red Pontiac potatoes for up to five months. 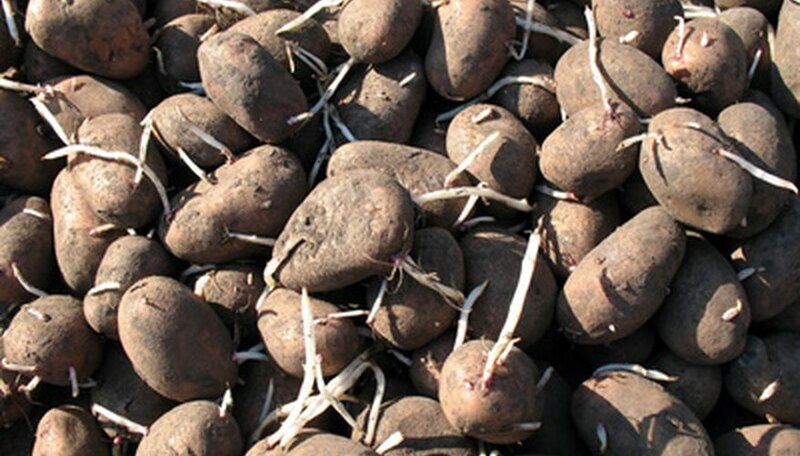 Plant potatoes after the last spring frost date in your region, as soon as soil is workable. This can be as early as April or May in most Northern regions. In Southern regions that experience high summer temperatures, potatoes do better as a winter crop. Potatoes grow best in relatively cool weather with daytime temperatures in the mid-60s and nighttime temperatures above 55 degrees Fahrenheit. Temperatures in the 90s can decrease yield, and temperatures above 95 degrees Fahrenheit may kill plants. Soil temperatures should fall between 60 and 70 degrees Fahrenheit, which can be verified with a meat thermometer probe, and mulch can help to maintain soil moisture and temperature. Seed potatoes are whole potatoes designated for use in growing new plants. Small seed potatoes may be planted whole, while larger ones can be cut into smaller chunks as long as each chunk contains an eye root. Although potatoes grow underground, seed potatoes do not need to be planted deep. Bury seed potatoes 12 inches apart under about 3 inches of soil, but leave at least 2 feet between rows so the root systems can spread out underground. 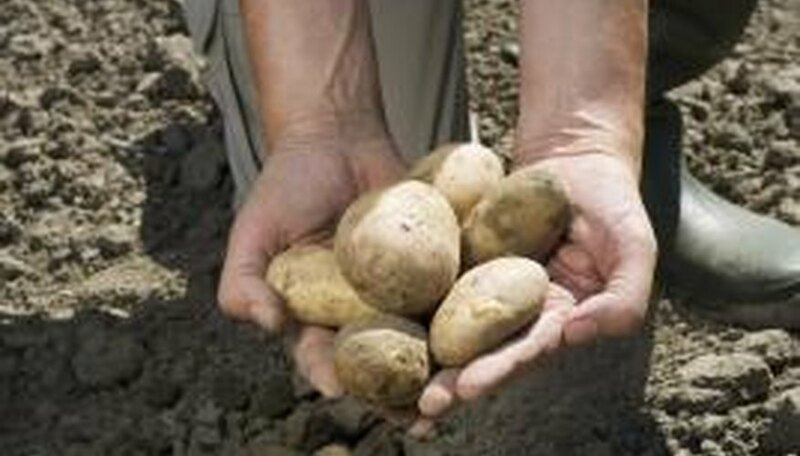 Pull soil into a hill to ensure roots are adequately covered to avoid sunburned potatoes. Water consistently to keep soil moist and loose. Idaho produces more potatoes than any other state in the U.S. -- nearly one-third of all potatoes grown in the country. California, Maine and Washington are also leading producers. The cool, humid climates in these states are ideal for growing and storing the vegetable. Purchase firm and unsprouted certified seed potatoes from a garden center or nursery. Order certified seed potatoes from a reputable catalog or online garden supplier if you are unable to find them in your area. Choose a full-sun planting location that receives six to eight hours of direct sunlight a day. Lay a wooden pallet flat on the ground in the planting location and stand four more pallets on their sides, so the pallets form a box with four sides and a bottom. Secure the corners of the pallet together with heavy gardening wire to create a sturdy wooden growing bin for your potatoes. Blend together equal parts peat moss and coarse builder's sand to create a well-draining growing medium for your potatoes. Cover the bottom pallet with several sheets of newspaper to prevent the growing medium from falling through the wooden slats. Top the newspaper with 12 inches of the growing medium. Place the seed potatoes on the surface of the growing medium. Space the seed potatoes 10 to 12 inches apart to allow adequate room for growth. Cover the seed potatoes with a six- to eight-inch layer of straw. Maintain the layer of straw throughout the entire growing season, adding more straw whenever the green potato shoots begin to emerge. Seed pieces may be whole potatoes or pieces of potatoes weighing about 2 ounces each. Each seed piece has to have at least one good eye. Create rows in the soil about one to three inches deep. Leave space of 24 to 36 inches between rows to allow the plants to shade the soil and prevent high soil temperatures that could inhibit potato growth. Leave spaces of 10 to 12 inches between seed pieces in the rows. The amount of garden space you need would depend on the number of seed pieces you want to plant.